Writers: Joe Penna, Ryan Morrison. Cast: Mads Mikkelsen, Maria Thelma Smáradóttir. 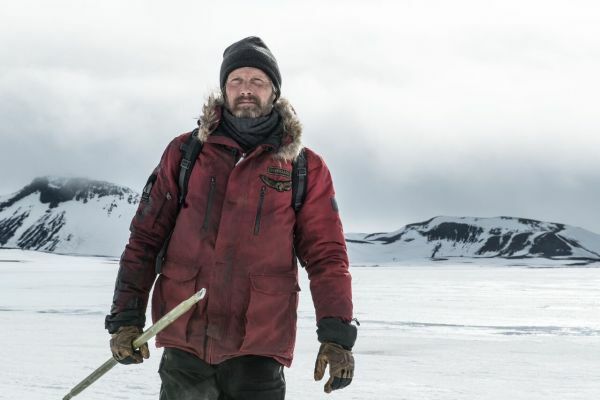 Arctic is a survival drama from first time feature filmmaker Joe Penna. Also written by Ryan Morrison, Arctic has recently shown at this year's Victoria Film Festival. This is the twenty-fifth year for the film festival. One of their biggest draws this year was this survivalist feature, which prominently featured Mads Mikkelsen as the stoic character Overgard. Filmed in Iceland, Arctic involves a cargo plane and a crash. Other rescuers try to help out, but more tragedy strikes. This film is very much a survival drama or survival thriller, with Overgard doing his best to escape an inhospitable landscape. Very sombre in tone, Arctic moves along at a decent pace. However, this is very much a minimalist feature. There are only two actors here and very little dialogue. So, Arctic is for those with a bit of patience, in search of a slower, more restrained film. Interestingly, the film begins after Overgard's crash. He is doing his best to survive on the snow and ice. He fishes, or sets up a radio beacon. Much of his time is spent in the crashed plane as Overgard hopes for rescue. Meanwhile, a polar bear is encircling his camp, looking for food. When another accident takes place, Overgard must decide how to get out of his worsening situation. Finding some heroism, Overgard sets out to find another station, which is over five kilometres away. His plan hits a few snags along the way. Mikkelsen as Overgard is in Almost Every Scene. The genre of the film is very much a survival thriller, with a bit of drama. A surprise or two comes out of wintry clime. But, this film very much focuses on Overgard and his struggles in this harsh climate. This character even develops some routines, for his day, to normalize events. But, danger is just over the next rise. Part of his fishing catch goes missing. And, the brutal winds make travelling difficult. It almost seems as if Overgard is one scene away from death, or from giving up on life. Still, this film does not end as viewers might expect. The film is a bit overly sombre. But, this is a dire situation. Overgard struggles with loneliness, until another character enters the picture. Still, very little is revealed about this character as every scene is about survival and the next few minutes. In later scenes, Overgard has experienced so many tragedies that he breaks down in tears. Mikkelsen really delivers a great performance here as some who is struggling to just carry on. However, he does have a bit of inspiration and his loneliness is briefly relieved in a few scenes. 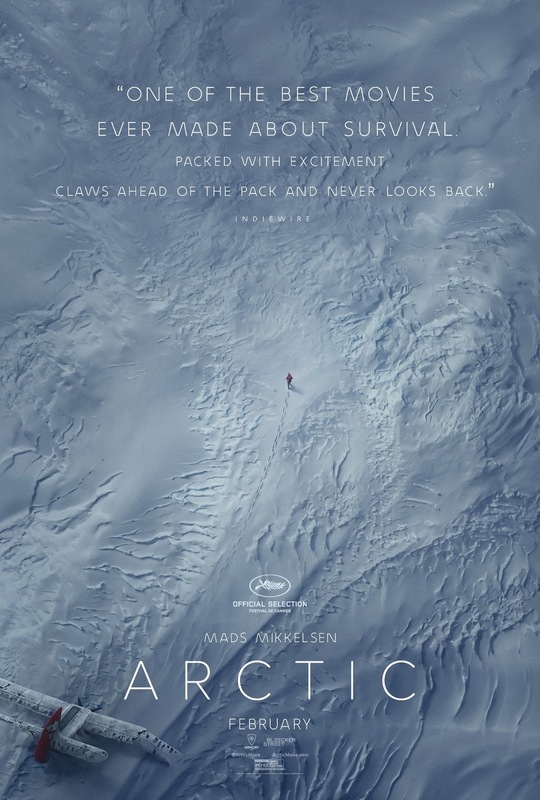 Overall, Arctic is very much a minimalist film. There is almost no dialogue for the first ten minutes. When others enter the mix, Overgard does interact with them. But, even these scenes are delivered more with body language than any words; there is no exposition here. Meanwhile, there is only one setting and readers will know where that is - from the title. Beautiful in cinematography, Arctic consistently looks amazing. But, the scenery does get a bit repetitive, with all of that white. Even the skies are overcast and grey. As well, action is kept to a minimum. There is only a scene or two involving tense action. Yet, it is consistently interesting to see how Overgard reactes to all of the unfortunate circumstances. Finally, the pacing is fairily even. Events and the the few plot points do not move ahead at break neck clip, so viewers will need to be patient to see how the story works itself out. Arctic is currently playing through a film festival run. There are several theatrical dates set for February, across North America. Showing dates can found at the film's homepage below. And, the Arctic is quite a bit different from all of the mainstream movies that come to town. Beautifully shot, Arctic will draw you into the characters. But, this is not an intense film. More a struggle with the self and with nature, Overgard must overcome both internal and external challenges to get the film to its final conclusion. Thankfully, there is a surprise or two, along the way, to keep viewers on their icey toes.